GAGE, THOMAS, army officer and colonial administrator; b. 1719 or 1720, the second son of Thomas Gage, 1st Viscount Gage in the Irish peerage, and his first wife, Benedicta Maria Theresa Hall; d. 2 April 1787 in London, England. The Gages of Firle in Sussex were an old Catholic family. Thomas Gage’s parents found it expedient to convert to the Church of England in 1715, but though they resumed the old faith before their deaths, their son was raised and remained an Anglican. He attended Westminster School in London and subsequently entered military service; by 1743 he was a captain in the 62nd Foot. In 1745 he was aide-de-camp to the Earl of Albemarle at Fontenoy (Belgium), fought at Culloden the next year, and in 1747–48 was again aide-de-camp to Albemarle in Flanders. He was stationed in Ireland from 1748 to 1755 with the 44th Foot, becoming its lieutenant-colonel by purchase on 2 March 1750/51. Gage’s career to this point had been of no particular distinction. When Major-General Edward Braddock was sent to America in 1755 with the 44th and 48th Foot to halt French advances in the Ohio country, James Wolfe* observed a little condescendingly that “My honest friend Gage is to be of the Ohio party.” Gage’s part in the disaster that overtook Braddock’s force near the forks of the Ohio on 9 July aroused some controversy, it being claimed that as commander of the advance party he should have stopped the rout of the head of the column, which caused the disorganization of the main force. Gage displayed personal bravery in the encounter; one witness (possibly Gabriel Christie) stated that he “distinguish’d himself by Encouraging the men as much as he Could and after they were broke, in rallying them.” It is equally clear that he failed to take possession of the high ground from which the French and Indians launched their attack, perhaps because, as he later claimed, he lacked irregular forces. In his subsequent career in America, Gage earned a reputation as a sound officer and an effective administrator. 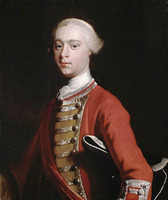 In 1757 Lord Loudoun, then commander-in-chief, thought the 44th one of his two best regiments because Gage “keeps up Discipline Strictly; the Regt is in Rags but look like Soldiers.” Gage saw little active service under Loudoun, although he did accompany him to Halifax, Nova Scotia, on the “cabbage planting expedition” of 1757, when plans to attack Louisbourg, Île Royale (Cape Breton Island), went awry. 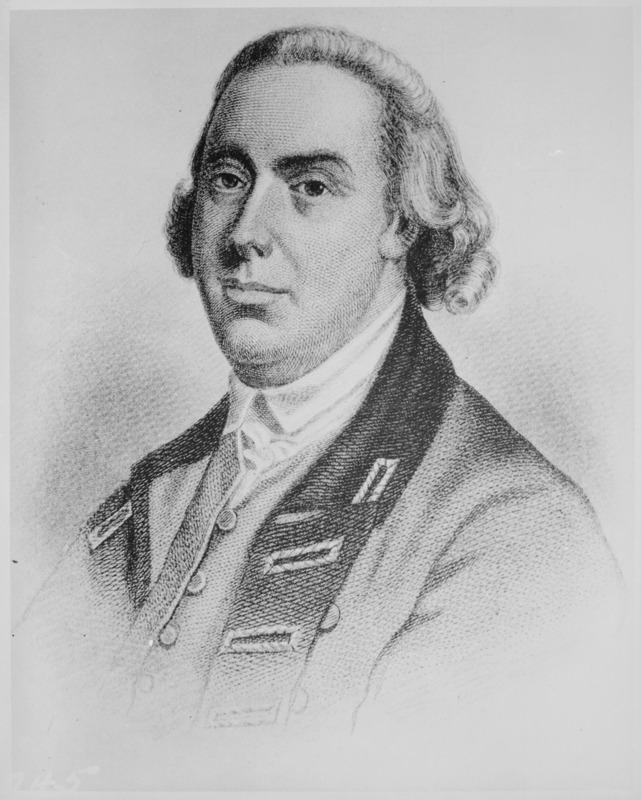 Gage was convinced that Braddock would not have been defeated had he possessed regular troops trained for forest war and in December 1757, taking advantage of Loudoun’s displeasure with the conduct of Robert Rogers’ ranger companies, he proposed to raise a regular regiment of light troops, provided the government met the costs and appointed him its colonel. The regiment so raised was the 80th, the first in the British army to be trained in both regular and irregular tactics. 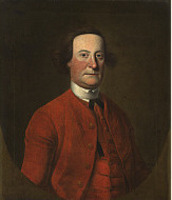 In 1758 it served in Abercromby’s assault upon Fort Carillon (Ticonderoga, N.Y.), where Gage, second in command after the death of Viscount Howe (George Augustus Howe), was slightly wounded. He had recruited the regiment in New Jersey, and found a wife there as well. On 8 Dec. 1758 he married Margaret, the daughter of Peter Kemble, a wealthy New Jersey merchant and politician, and Gertrude Bayard, who was connected with the important Schuyler, De Lancey, and Van Cortlandt families of New York. Five daughters and six sons were to be born to the couple. By the time of his marriage Gage had become a brigadier-general in America. 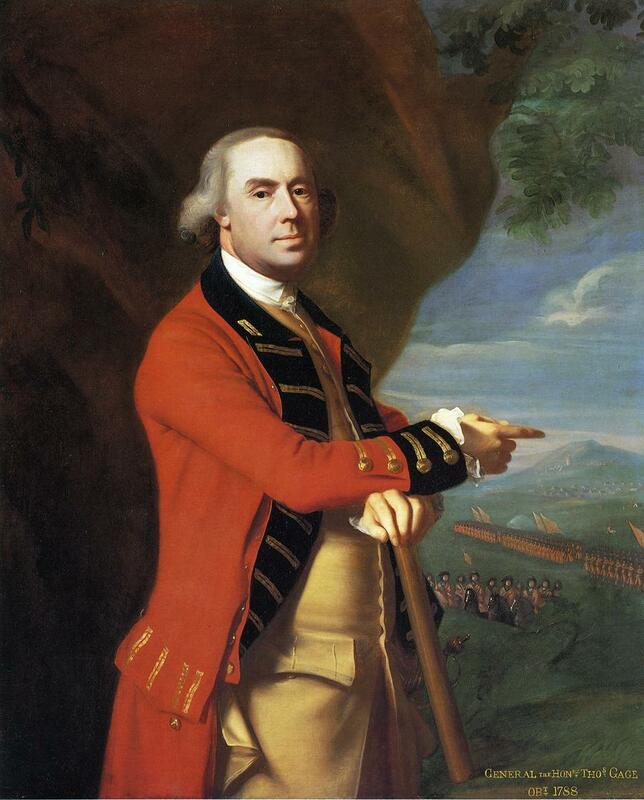 In July 1759 Gage got his first independent command. Amherst ordered him to take the French post at La Galette (near Ogdensburg, N.Y.) to help Wolfe’s siege of Quebec and to “make a frontier” along with Crown Point (N.Y.), Oswego, and Niagara (near Youngstown) in case Wolfe was defeated. Before he reached Oswego to take over from Sir William Johnson, Amherst further directed him to advance toward Montreal after capturing La Galette. Gage’s subsequent conduct disclosed his shortcomings as a commander. Doubts assailed him even as he reached Oswego; he told Johnson that he did not believe in “running his head against a wall, or attempting impossibilities.” Rather than viewing his command as a chance to achieve strategic results by applying pressure from the west, he saw only problems. The Oswego defences needed strengthening, supplies were short, French vessels controlled the St Lawrence, and La Galette, if taken, would prove vulnerable to counter-attack during the winter. In a “long discourse” with Johnson on 6 September, he argued that Amherst had left his assistance to Wolfe too late, and that unless a concerted movement was made upon Montreal, “an expedition this way would be of no service.” Four days later he wrote to Amherst informing him of his decision not to attack the French post or move on Montreal. But Johnson’s scouts inconveniently reported La Galette to be lightly held, and Gage thereupon consulted his senior officers. Finding them divided, he decided to stick to his original decision. A furious Amherst upbraided Gage for missing a great opportunity, charging that he and his officers had “found out difficulties where there are none.” This criticism was not altogether fair, but certainly Gage’s chief virtues as a soldier were caution and a diligent attention to details, not boldness and the urge to battle. Where another man might have seen a golden opportunity to end the war in 1759, he saw only obstacles. It is noteworthy that when Amherst took Montreal in 1760, Gage commanded the rearguard. 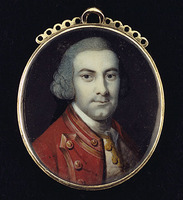 Despite their differences, Amherst respected Gage’s administrative capacities and in September 1760 appointed him military governor of Montreal, along with Ralph Burton* at Trois-Rivières; James Murray was already military governor at Quebec. 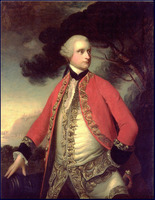 Gage was the senior officer of the three, and in 1761 was promoted major-general, but he never claimed authority over the others, and indeed referred to the military governors collectively as “the Three Kings.” Characteristically, he thought of himself “in no other light, than as a Military Governor,” appointed by Amherst, responsible only to him, and under his orders and direction. 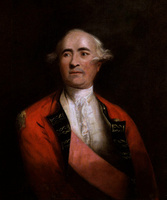 Thus in May 1763, when the Board of Trade sent him a series of questions about Canada, he told Amherst that since “I know of no general Governor thereof (but yourself as Commander in Chief),” he had sent duplicates of the questionnaire to Murray and Burton. There is no full account of Gage as military governor of Montreal, although his biographer John Alden has a short chapter on the subject and brief references are to be found in Alfred Leroy Burt, The old province of Quebec (2v., Toronto and Minneapolis, Minn., 1933; repr. Toronto, 1968), and in Hilda Neatby*, Quebec: the revolutionary age, 1760–1791 (Toronto, 1966). That the three governments were separate jurisdictions and their governors responsible to Amherst seems either to have been missed or to have been treated perfunctorily by most historians. Burt was certainly aware of the situation, and indeed draws attention to Gage’s distinctive policy with respect to the administration of justice, while Neatby mentions specific actions taken by Gage within his jurisdiction. But quite naturally their attention, and that of other historians, focussed on Murray, since he was governor of Quebec, the capital of the colony and its traditional centre. Gage’s work at Montreal merits more attention than it can be given here, in part because of his special responsibility for the fur trade and the interior. In important respects Gage departed from previous practice. He made innovative use, for example, of the captains of militia in their judicial capacity. 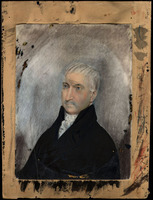 Instead of retaining the courts of individual captains, as Murray did, one of his first acts in Montreal was to constitute all the captains of the town as a single court, to meet weekly to “settle all disputes of private individuals.” He found that this system worked well, telling Amherst that the captains had “acted with so much uprightness and Justice in their Decisions, as to gain great Reputation to themselves, & to ease me of a great deal of Trouble.” As a result, in 1761 he extended the arrangement to the rest of his territory, in order to make justice “more prompt and easy and less expensive to those who are obliged to have recourse to it.” Haldimand copied the system in Trois-Rivières, and in both governances it remained unchanged until the commencement of civil rule. Gage was also innovative in his attitude toward trade. The French policy of granting monopolies for the interior fur trade was not “Worthy our Imitations,” he thought, and in an ordinance of 1 April 1761 he declared that “the trade is free for everybody” though subject to a passport system. 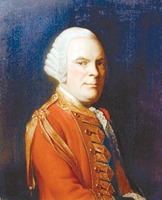 He believed that the interior trade should be controlled by restricting the number of posts and placing them under the surveillance of military detachments in order to prevent trouble with the Indians, a policy he was later to promote as commander in chief, in collaboration with Sir William Johnson. He was nevertheless generally sympathetic towards merchants, whether French or English, and feared what he termed the “heavy hand” of the Board of Trade. Unless the Board cramped Canada’s trade, he thought the province would become a rich and flourishing one, attractive to people of property, and a place where “many branches of Trade will be struck out, which the French never thought of, or were prevented from pursuing.” He was encouraged in 1762 when some of the Canadian merchants began to trade their furs on the London market. 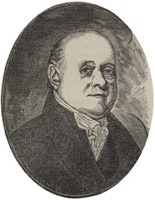 While in Montreal Gage was regarded as an honest, fair, and conscientious administrator, a reputation he was to enjoy in the southern colonies as well. There is no reason to doubt his assertion that he had endeavoured to treat the Canadians with kindness and humanity, and had made it his business to protect them in their laws, religion, and property, despite the fact that his private feelings for some elements of the population were unfriendly. 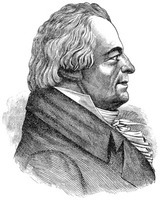 He cared little for the seigneurs, especially the officers among them; “the sooner these Croix de St. Louis, with the rest of the idle Noblesse, leave the Country, the better it will be for it.” As for the priests, “those black Gentry,” he distrusted them all as the hidden promoters of French influence. 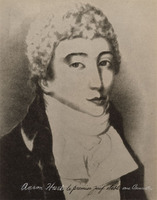 By 1763 Gage was ready to give up his command and return to England; as he told Amherst, it was not that he was tired of America, but “very much of this cursed Climate, and I must be bribed very high to stay here any longer.” He was. In October he left Montreal for New York, where he became acting commander-in-chief on Amherst’s departure the next month. Confirmed in this appointment in 1764, he remained in it until his recall in 1775. His work in this post touched the northern colonies in many ways, not only with respect to their military establishments but also in such matters as Indian affairs. But his chief concerns were with the thirteen southern colonies, especially as politics there grew more turbulent. Gage’s advice to the home government on the situation in America was invariably cautious. Yet while on leave in England in 1774 he encouraged George III to believe that strong measures would curb the Americans, a point of view he had expressed in private letters for some years. Summarizing Gage’s views, the king told Lord North, the prime minister, that Gage “says they will be Lyons, whilst we are Lambs but if we take the resolute part they will undoubtedly prove very meek.” He returned to America in May 1774 with the additional post of governor of Massachusetts, and his early dispatches led the home government to believe that the crisis was passing. 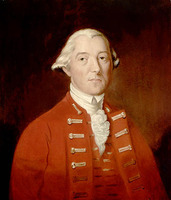 Subsequently, however, the situation worsened; Gage transferred the bulk of his forces to Boston, where they were to be effectually locked up; and during September and October gave such bleak accounts to Lord Dartmouth, secretary of state for the American Colonies, that he lost all credit at home. On receipt of Dartmouth’s instructions “to take a more active & determined part,” he ordered the seizure of rebel stores at Concord on 19 April 1775 that inaugurated hostilities in the revolutionary war. Gage has been held responsible by a number of American historians for encouraging the use of Indians against the rebels. As early as 4 Sept. 1774, when withdrawing two regiments from Quebec to reinforce the Boston garrison, he asked Governor Guy Carleton* whether it would be possible to raise “a Body of Canadians and Indians” for service outside the province “should matters come to Extremities.” He waited, however, until some Stockbridge Indians had been identified among the American forces investing Boston before telling Dartmouth, on 12 June 1775, that “we need not be tender of calling upon the Savages, as the Rebels have shewn us the Example.” As his critics have suggested, this was something of a pretext; Gage himself admitted to Carleton that the Stockbridges were scarcely the formidable Indians of the frontiers but rather “what the French would call Domiciliés, and not of great worth.” But Gage cannot be saddled with major responsibility for the Indian participation in the revolution. Indian peoples such as the Six Nations had good reason to enter the war, and it was inevitable that most Indian tribes would side with the British. By mid 1775 Gage’s days in America were numbered. 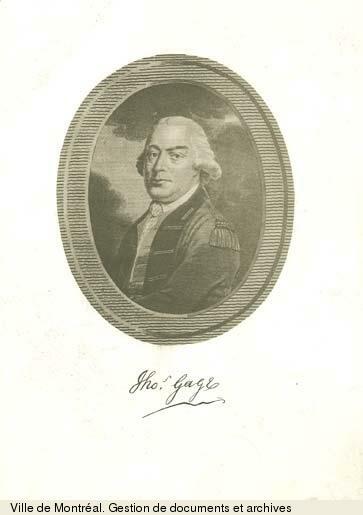 In June Lord George Germain, the new secretary of state for the American Colonies, anticipated his removal when he observed that despite his good qualities, Gage was “in a situation of too great importance for his talents.” Though a capable administrator, Gage had never shown high military abilities and indeed had lost the confidence of his troops and senior officers [see John Burgoyne]. He was recalled in August, ostensibly for consultations, and sailed from Boston on 10 October. 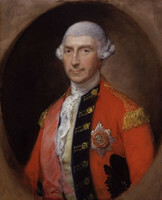 His only further military appointment was to command the defence forces of Kent in 1781. In 1782 he was made a full general. 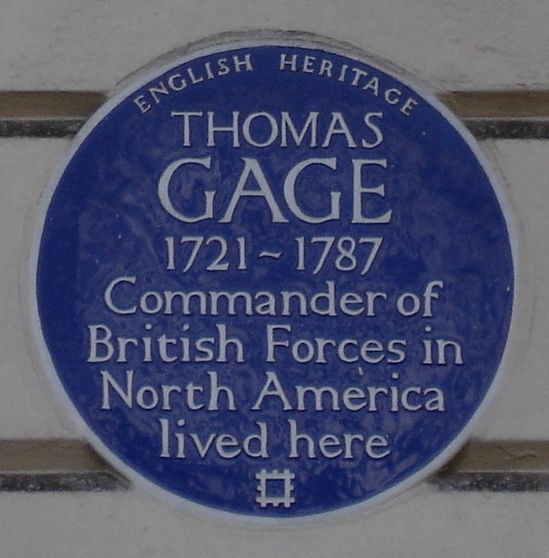 Thomas Gage was a representative product of the 18th-century British army. His family and political connections, the system of purchase, and his own solid administrative abilities had helped him rise to positions of responsibility. His personal reputation as a fair-minded commander, a devoted family man, and an amiable and charming host remained unblemished. In Montreal all these qualities won him a reputation as a just and competent governor. As a soldier, however, his record in actual operations was not distinguished. Neither in the La Galette affair nor during the far more complex crisis in Boston in 1774–75 did he display the political and strategic grasp which those situations demanded. [The volume of documents relating to Thomas Gage is immense. The largest collections are in the Clements Library, University of Michigan, and in the PRO, CO 5 series. 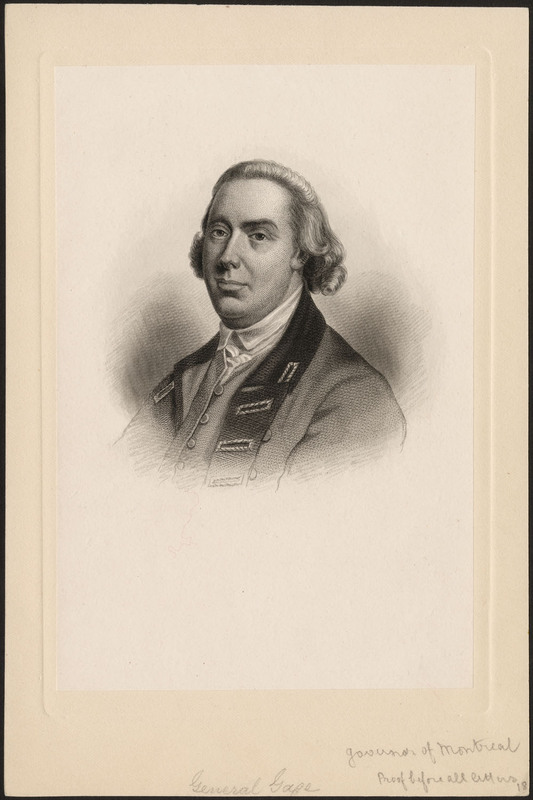 Selections from these collections are printed in Correspondence of General Thomas Gage (Carter). Gage’s correspondence with Amherst from 1758 to 1760 can be found in PAC, MG 11, which contains transcripts of CO 5/56–59, and his correspondence with Amherst during his governorship of Montreal in PAC, MG 13, which contains transcripts of PRO, WO 34/5. His correspondence with Frederick Haldimand from 1758 to 1763 is in PAC, MG 21, which contains transcripts of BL, Add. mss 21661. J. R. Alden, General Gage in America; being principally a history of his role in the American revolution (Baton Rouge, La., 1948), is a scholarly and sympathetic biography. Much less favourable are two studies by John Shy, Toward Lexington, and “Thomas Gage, weak link of empire,” in George Washington’s opponents: British generals and admirals in the American revolution, ed. G. A. Billias (New York, 1969). Short biographies are included in the DAB and the DNB. Sources for particular episodes in Gage’s career are as follows: for the Braddock expedition, Military affairs in North America, 1748–65 (Pargellis) and Correspondence of William Shirley (Lincoln), II. 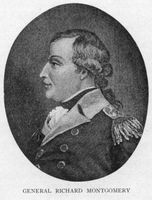 Captain Robert Orme of Braddock’s staff attributed the disaster to the collapse of Gage’s advance party, and to “a manner of fighting” to which the troops were unused (Correspondence of William Shirley, II, 208). In response to an inquiry instituted by Shirley, the new commander-in-chief, Gage and Thomas Dunbar, the two regimental commanders, claimed that the morale of the troops was low, partly because of the influence of “the Provincial Troops and Country People,” who had told them that “if they engaged the Indians in their European manner of fighting, they would be beat.” They also drew attention to the shortage of light troops – only “three or four” scouts were in front of the column – and to “the Novelty of an invisible Enemy and the Nature of the Country, which was entirely a Forest” (Correspondence of William Shirley, II, 313). Shirley did not accept this response. He blamed Gage for failing to occupy the high ground and for losing control of the vanguard, but agreed that the French should be imitated in their use of screens of irregulars to protect regular forces. 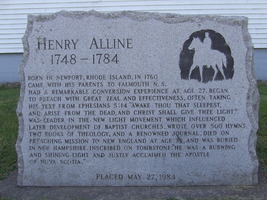 Alden (pp.24–27) argues that Gage lacked the requisite authority to occupy the high ground, while Shy (Toward Lexington) and L. H. Gipson (The British empire before the American revolution (15v., Caldwell, Idaho, and New York, 1936–70), VI, chap.4) take the view that he should have displayed more initiative. Contemporary descriptions of the action are found in Military affairs, 96–117. For Loudoun, see Pargellis, Lord Loudoun, 234, 299–305. Sir William Johnson’s revealing account of Gage’s hesitations in 1759 is in Knox, Hist. journal (Doughty), III, 187–232; see also Amherst, Journal (Webster). 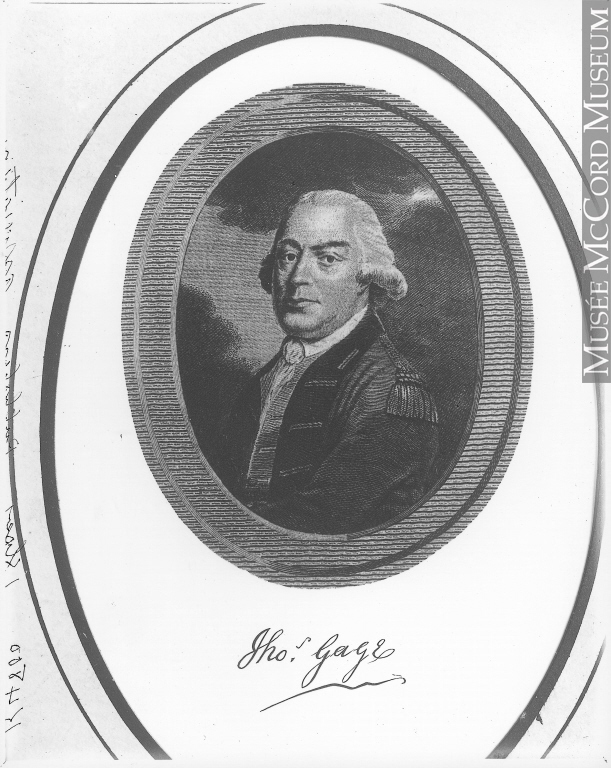 There is no full account of Gage as military governor of Montreal, though brief references are in Burt, Old prov. of Que., and Nearby, Quebec. Gage’s ordinances as governor are printed in PAC Report, 1918, app.B, 21–77, and his “Report of the state of the Government of Montreal” of 20 March 1762 in Docs. relating to constitutional history, 1759–91 (Shortt and Doughty; 1918), I, 91–95. Excerpts from his correspondence with Carleton in 1774–75 are in ibid., II, 583–84, and 661–62. S. F. Wise, “GAGE, THOMAS,” in Dictionary of Canadian Biography, vol. 4, University of Toronto/Université Laval, 2003–, accessed April 24, 2019, http://www.biographi.ca/en/bio/gage_thomas_4E.html.